John Deere has appointed ProVQ as its new partner to deliver the company’s award winning apprentice training programmes, replacing the previous provider Babcock. ProVQ’s sister company ProAuto started business in 1999, offering high quality technical training courses for adult technicians working in the automotive industry. ProVQ was established in 2005 to apply this training expertise to apprentice programmes, developing a full range of services including apprentice recruitment, training, vocational assessment and qualifications; the two companies merged in 2013. Today the company trains over 600 apprentices and many hundreds of adult learners on technical, parts and customer service programmes, working in national partnership with businesses such as Toyota Lexus, Porsche Cars, Mitsubishi and Halfords. John Deere apprentices who are already enrolled with Babcock on the Ag Tech, Parts Tech, Turf Tech and Customer Service Tech programmes will transfer directly to ProVQ, as will the staff who currently look after them, both in the field and during the residential training blocks. For the new training year starting this autumn, first year apprentices will be based from November at a new Apprentice Training Centre located at Radcliffe-on-Trent, 15 minutes away from John Deere Limited’s headquarters at Langar, Nottingham. The second and third year apprentice programmes will then transfer to the new training centre from Babcock’s premises at Ruddington. 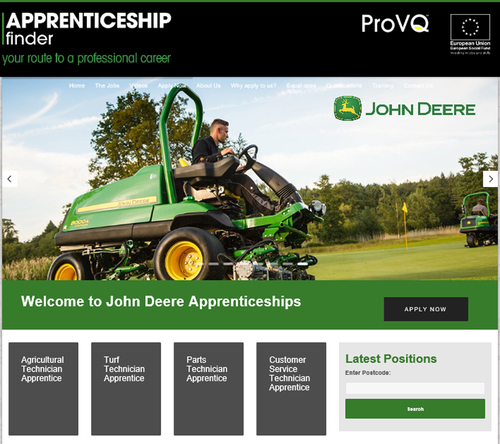 A new dedicated registration page (pictured) is now live on the ProVQ Apprenticeshipfinder website, at http://apprenticeshipfinder.co.uk/john-deere. This provides a short description of each of the John Deere apprentice programmes and a link to the application form. “For quite a number of years now my company and I have worked within the light vehicle automotive sector, but my career background is in heavy diesels and it’s great to be back!” says ProVQ Ltd managing director Julian Lloyd.